December-2013. It is the season to be jolly. Charles Dickens once wrote “we need never be ashamed of our tears” (in his ‘Great Expectations’). This, of course, presumes that we have sufficient tears in the first place. For the unfortunate who are afflicted with dry eyes (keratoconjunctivitis sicca), artificial tears have filled the void and provided endless pain relief. One of the primary components in artificial tears is hydroxypropyl cellulose, a cellulose derivative which acts as a thickener in aqueous solutions and provides ophthalmic protection and lubrication. 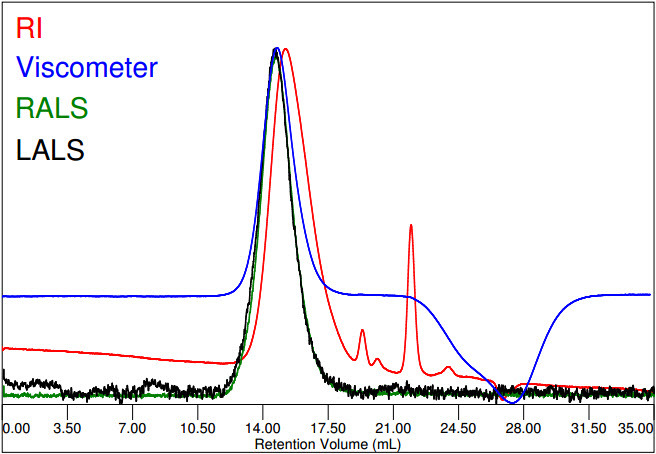 Here is an example chromatogram of modified cellulose. The run conditions and some results are detailed in the table below. Chromatogram of Hydroxypropyl Cellulose HPC. Collected from a “Viscotek TDAmax system” consisting of Refractive index RI, Viscometer, Right angle light scattering RALS and Low angle light scattering LALS shown versus elution volume. Hydroxypropyl cellulose is a nonionic water soluble cellulose ester with wide areas of applications such as adhesives, coatings, cosmetics, food and pharmaceuticals. Properties like molecular weight distribution and branching are critical to various applications and the consistency of a product. Data were acquired on a Viscotek TDAmax system. Both the 7º (LALS) and 90º (RALS) light scattering measurements overlay however as often typical for relatively small molecules and low concentration, the RALS 90 degree signal exhibits less noise in the signal baseline.